Founded in December 2009, Toronto-based Kobo has emerged in the last two years as a global DIY self-publishing platform and e-bookstore, as well as producing its own range of e-reader devices. Originally owned by Indigo Books & Music, Japanese corporation Rakuten bought a controlling, majority stake in the company in 2012. The company’s name is an anagram of ‘book’ with perhaps an unintentional nod to the Japanese origins of the word—Kōbō (Kōbō-Daishi was the posthumous name of Kūkai , a monk, civil servant, scholar, poet and artist; and Kōbō Kenichi is a former sumo wrestler!). Kobo now operates one of the world’s largest e-bookstores with a catalogue of 4 million titles across 68 languages and reaching readers in 200 countries. Like Amazon’s Kindle Direct Publishing (KDP), Kobo provides a publishing platform and access to sales channel(s), and its own branded e-reader device. But where Amazon is ultimately a retailer focused on selling all kinds of products to customers, Kobo’s focus is distributing and selling books to readers. Beyond the walled gardens of Seattle, Washington, Kobo is everything Amazon isn’t—a global self-publishing platform with no walled garden, with a distribution engine supporting the sale of e-books in ePub and PDF formats for all authors and publishers—no strings or restrictions attached. Kobo’s publishing platform is called Kobo Writing Life (KWL), and like Smashwords, KWL has a more author and reader-friendly branding about it. Where Amazon developed and added KDP for authors and publishers, Kobo and KWL has the feel of a publishing platform and community built from the ground up—specifically for books, readers and authors. Since last year, Kobo has been expanding its distribution and publishing platform—from the USA and Canada—into Europe, and it can now be used by authors and publishers based in England, Spain, Portugal, Germany, Italy, Netherlands and Brazil. 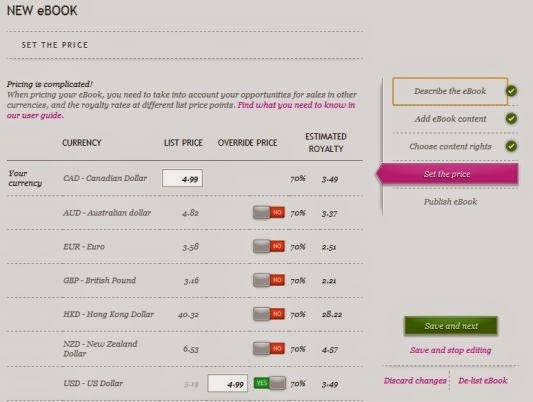 KWL does not charge a fee for using the platform. It makes money on its percentage take from the sale of e-books to its retail partners. You need to sign up for an account with KWL (as distinct from Kobo’s Reading Life), accept its terms and conditions, before publishing an e-book. This includes providing your bank details and specifying payment currency. I found this section a little tricky and it took several attempts to fill out the form correctly and get it to accept my details. This is perhaps because KWL was originally built as a USA/Canadian platform. As with any DIY self-publishing platform, I strongly advise authors and small publishers to familiarise themselves with any available guides or manuals the platform provides. Every platform has its own inbuilt requirements and quirks—just because a user has created a finished file for Kindle or Smashwords, it doesn’t mean that file will upload and convert without oddities. KWL’s vendor guidelines can be found here. 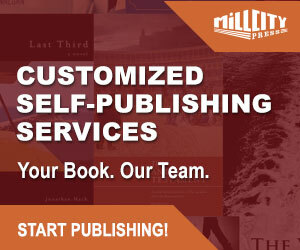 Once you access your KWL dashboard, the initial book set-up is reasonably straight forward and is pretty much the same as any of the DIY self-publishing platforms. 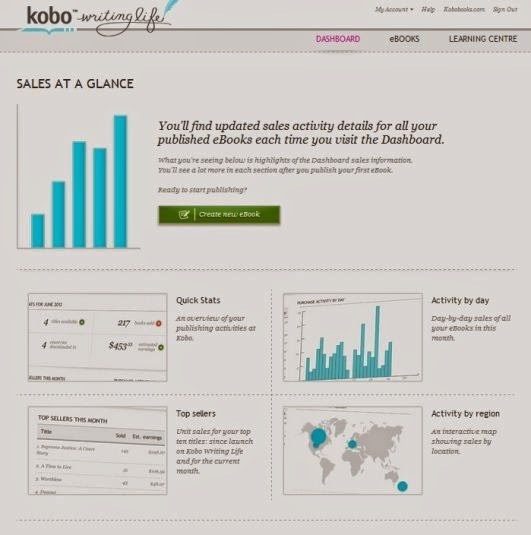 The dashboard is also the place to access your sales reports once you begin selling through Kobo. As always, make sure you have all the details you need to hand. I find that creating a MS Word document with all the book details like title, subtitle, author name, series name, publisher, imprint, publication date, ISBN, categories and metadata, synopsis etc. I like the layout of the KWL UI (user interface) and it is easy to follow the steps. KWL suggests that cover images should be in 900 DPI and with a file size no large than 1mb. I have to say that seems an extremely high definition and I tested it with lower resolutions without trouble. Images must be JPEG or PNG formatted files. Kobo allows a wide variety of format upload for internal book files—text, doc or docx, ePub, OPF, mobi (Kindle’s format), and HTML. KWL advise that the best file for upload is directly with ePub or using OPF (OPF gives the cleanest translation’ during the conversion process). A complete manual for KWL’s conversion guidelines can be found here. For doc and docx files, KWL advises users to use the built in formatting options included in your word processing program. A lot of the KWL guidelines for these formats reflect much of what Smashwords’ Styleguide advise. NOTE: Text wraps should be above and below the images, not around the image. KWL’s conversion also creates anomalies if you try to use symbols—avoid these at all costs. I tested one upload using a mobi file and this created some formatting glitches. The best results achieved where with a complete ePub file and a stripped clean docx file. I recommend you have access to an ePub reader/application or load it into software like Calibre before you fully review your file. I found this a little irksome on the KWL e-book preview and it doesn’t look as good as the one on Amazon KDP. I would prefer KWL had a better online preview tool. Ultimately, you really should download and properly test an e-book file locally on your computer or e-reader device, regardless of the DIY self-publishing platform you use. Kobo pay author royalties via direct bank deposit on a monthly basis, but only if author earnings exceed a $75 threshold (was originally $100). Otherwise, Kobo will wait until the $75 is reached, or will pay regardless when six months has passed. That may put off some authors, particularly those not anticipating large e-book sales. 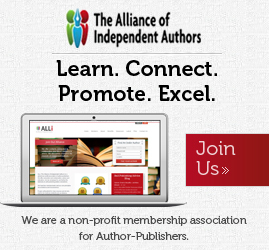 Authors are paid 45 days after the end of each monthly period, once the threshold is met. You can publish an e-book on KWL without an ISBN, but this will only make your book available through Kobo’s bookstore. Most of Kobo’s external retail partners require an ISBN and I strongly recommend authors invest in a block of ISBNs. NOTE: unlike Smashwords, Kobo’s KWL does not directly supply ISBNs. A KWL user can terminate their agreement anytime and books will be delisted from the Kobo bookstore and its retail partners. This process should take 24 hours, though I find it hard to believe that it will happen this quick for all of Kobo’s external retail partners. One benefit of Kobo’s KWL is that authors can promote their books for free without the restriction of exclusivity to Kobo, unlike KDP’s Select program, which requires exclusivity and only allows an author to list e-books at ‘free’ for five out of ninety days. The UI is pleasing and easy to use. If you are publishing an e-book for the first time then you can’t go too far wrong with Kobo’s KWL. It has excellent distribution reach and continues to add retail partners across Europe. I also like the general transparency and lack of jargon throughout KWL. Indeed, KWL states in its guide that authors may prefer to work with a digital aggregator like Bookbaby, Bookmasters or Smashwords, who are all partners of Kobo. That’s one of the big negatives against KWL, because it is a single distributor and does not provide any kind of additional services beyond its support network. It will attract authors frustrated by the Smashwords Meatgrinder and those authors who want more reach than just Amazon availability. Crucially, KWL uses and supports ePub, the universal e-book file format. Combining KWL with Amazon KDP could also be an ideal option. I found Kobo’s bookstore much more appealing and functional than the Smashwords store, though not as good as Amazon’s Kindle store. You are also going to limit your external distribution options if you choose to work with KWL without ISBNs. PROS: Easy to use interface and tools, no upload fee, uses ePub, strong distribution channels in USA, UK, Europe and Asia, DRM can be on or off, ability to sell free e-book for unlimited time period, ISBN not required for distribution to Kobo bookstore. CONS: Royalty threshold may result in only 6 monthly payments, no distribution to Kindle, no additional services for e-book creation, no supply of single ISBNs, Bank account required (no royalty payments made through PayPal or cheque). Thanks for such a detailed review. I find it quite useful as I prepare to write several ebooks. Overall I like Writing Life. The upload process is smooth and uncomplicated, breaking the metadata entry and upload into a few screens to ensure nothing important gets overlooked, and for the most part the processed ePub they produce is quite faithful to the originals. The only major issue I’ve run into is that I’ve had 2 books get stuck in processing. Most titles go live the same or next day, but there’s a glitch where some submitted books never make it to their vetting team and won’t ever clear to On Sale status unless you reach out to Kobo. It’s a common enough problem that they ask you to let them know if something isn’t live within 48 hours. Turnaround time on customer service requests isn’t as fast as someone used to Amazon might hope for, but is better than I’ve had from iTunes. For customers I’d like to see them make it more clear on the webstore what content is DRMed and what isn’t. They used to be specific, but when they redesigned the site they switched to a more vague list of devices supported. I’ve found there are still a couple of ways to tell, but they wouldn’t be obvious to everyone, and the minority of customers who only buy DRM-free might hesitate to buy from Kobo. I wish we got more sales so as to better justify the few minutes spent uploading each title. At the sales volume most of my clients see there, I’ve had to start recommending they send new books through Smashwords or another distro instead to save themselves time and get paid more often. Maybe things will pick up some with the transfer of Sony customers now complete and the addition of the Kobo store now available for some of the newer Sony devices. Great review of KWL – thanks for writing it. One thing I should point out is that there isn’t a 5 day limit in a 90 day period, as mentioned – you’re likely confusing that with Amazon’s KDP Select program. Authors and publishers can make their books free using KWL for as long as they want with no restrictions. Yes, it’s all fine and dandy, Mark, until you have an actual problem. It’s been a MONTH since the last update from Kobo Support, telling me they’d get back to me “within 24 to 48 hours”. I emailed them again on 21-June. Nada. And let’s not mention the kneejerk reaction to WH Smith. Traditionally published erotica stayed but you pulled all indie titles? Not cool. It’s yours to lose, Mark, not Amazon’s to gain. Thanks, Mark, for the feedback. Talked to Christine and going to update in the coming hours. I think the FREE book pricing is a big incentive for marketing, and I will also reflect that in the rating. Thanks, Mick – shall I keep you posted as the $100 threshold (which is now at $75) continues to be lowered. Thanks! This was very useful information. And as a photographer, I’m gonna say that 900DPI must be some kind of mistake. The file size alone would gum up any system! 300dpi is PLENTY good enough and even as low as 150dpi could get you a decent print. I can’t imagine where they got 900dpi from. I’ve heard Smashwords “Meatgrinder” is amazing at getting the formatting all done. But I was thinking I’d rather just upload the files myself to the few sites I’m planning on using rather than using a service like Smashwords, which takes an additional cut of your revenue. 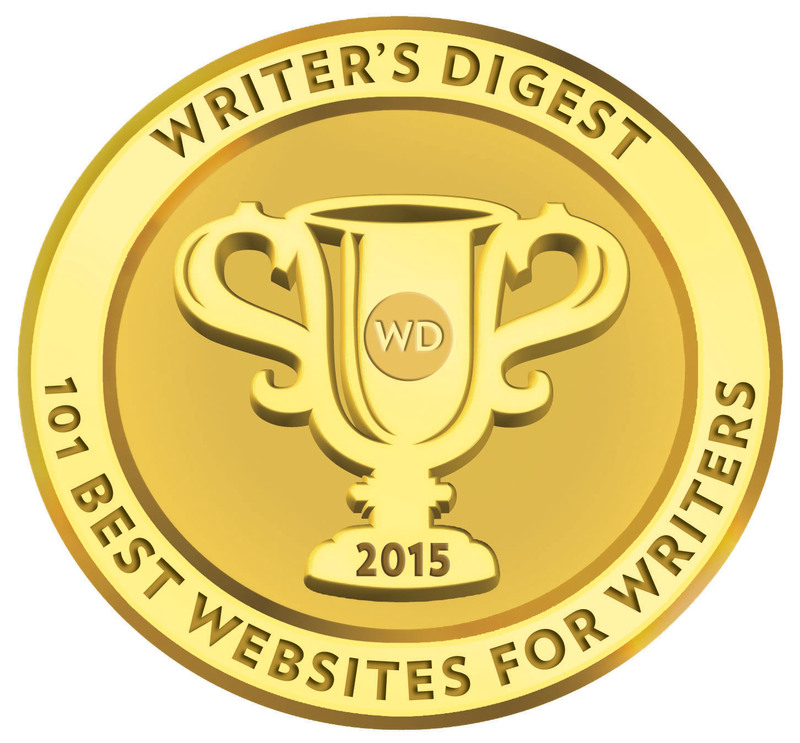 Do you have an article about Smashwords already? Hi HL, yes, we did Smashwords. Check out the pub index or just do a site search for review. You are a wizard if you succeeded to enter the banking information. I went twice to both my BMO and RBC for swift numbers to no avail What is the trick ? It’s almost a year, kobo isn’t issuing my payments. I try contacting them and i’m avoided like a plague. Writing life not responding and the individuals in charge of payments just keep changing so no one to follow up. What happened to Kobo these days? it never used to be the case.